how the solutions of a quadratic equation is related to the graph of the quadratic function. how to use the graphical method to solve quadratic equations. We also have a quadratic equations calculator that can solve quadratic equations algebraically and graphically. We can solve a quadratic equation by factoring, completing the square, using the quadratic formula or using the graphical method. Compared to the other methods, the graphical method only gives an estimate to the solution(s). If the graph of the quadratic function crosses the x-axis at two points then we have two solutions. If the graph touches the x-axis at one point then we have one solution. If the graph does not intersect with the x-axis then the equation has no real solution. 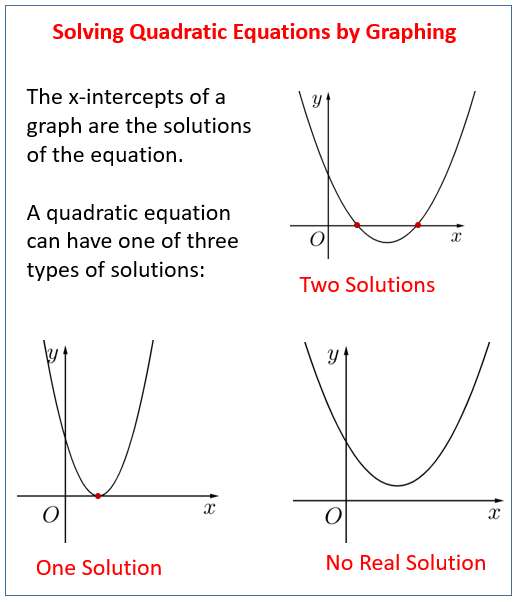 The following diagrams show the three types of solutions that a quadratic equation can have: two solutions, one solution and no real solution. Scroll down the page for more examples and solutions. The following video explains how the quadratic graph can show the number of solutions for the quadratic equation and the values of the solutions. Examples of how to use the graph of a quadratic function to solve a quadratic equation: Two solutions, one solution and no solution. We will now graph a quadratic equation that has two solutions. The solutions are given by the two points where the graph intersects the x-axis. Solve the equation x2 + x – 3 = 0 by drawing its graph for –3 ≤ x ≤ 2. Draw the graph for y = x2 + x – 3 for –3 ≤ x ≤ 2. 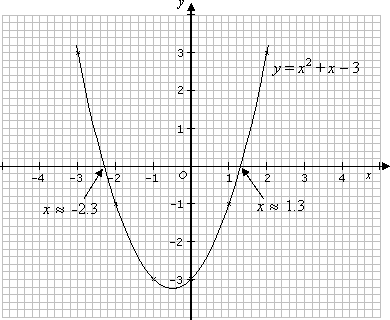 The solution for the equation x2 + x – 3 can be obtained by looking at the points where the graph y = x2 + x – 3 cuts the x-axis (i.e. y = 0). So, the solution for the equation x + x –3 is x 1.3 or x –2.3. Recall that in the quadratic formula, the discriminant b2 – 4ac is positive when there are two distinct real solutions (or roots). How to solve quadratic equation by graphing? It uses the vertex formula to get the vertex which also gives an idea of what values to choose to plot the points. This is an example where the coefficient of x2 is positive. This video shows an example of solving quadratic equation by graphing. It uses the vertex formula to get the vertex which also gives an idea of what values to choose to plot the points. This is an example where the coefficient of x2 is negative. By plotting the graph, solve the equation 6x – 9 – x2 = 0. Notice that the graph does not cross the x-axis, but touches the x-axis at x = 3. This means that the equation 6x – 9 – x2 = 0 has one solution (or equal roots) of x = 3. Recall that in the quadratic formula, in such a case where the roots are equal, the discriminant b2 – 4ac = 0. Solve the equation x2 + 4x + 8 = 0 using the graphical method. Notice that the graph does not cross or touch the x-axis. This means that the equation x2 + 4x + 8 = 0 does not have any real solution (or roots). Recall that in the quadratic formula, the discriminant b2 – 4ac, is negative when there are no real solution (or roots). This video demonstrates how to solve quadratic equations by graphing. 1. Solve one side of the equation for zero. 2. Change the zero to y or f(x). 4. Read the solutions where the function crosses or touches the x-axis. Roots, x-intercepts, and zeros are given as synonyms for solutions. Finding roots from a table of values is also demonstrated. This video shows how to solve quadratic equations using the TI84 and TI83 series of graphing calculators. Five problems are worked out. The different steps are shown including converting quadratic equations into calculator ready graphable quadratic functions. The video shows how to examine in graph and table view what the solutions are. The case of having no solutions is shown as well as that of having only one solution. This Quadratic Equation calculator will solve the given quadratic equation algebraically and graphically. Use it to check your answers.